The AM 910/x1x is a single-width processor board with PCI Express® (PCIe) Gen 3 backplane connectivity. The AM 91x/x1x is a plug-compatible upgrade for the previous generation AM 31x/x1x. Users of the AM 91x/x1x could experience an increase of up to 15% in CPU performance and an increase of up to 50% in graphics performance when compared to previous architectures while operating within the same power budget as previous Intel® Core™ processor-based AMC products. The PCIe Gen 3 capability complements the increased processing power by effectively delivering double the bit rate of PCIe Gen 2. Designed to extend Intel® Processors with RapidIO® Fabric into large processor system. The AM 92x/x1x is designed in compliance to AMC.0 (including full hot swap and IPMI capabilities), AMC.2 Type E2 (2x Gigabit Ethernet) and AMC.3 Type S2 (2x SATA ports). Additionally, the front panel provides connectivity to a Gigabit Ethernet port, DisplayPort interface, a USB port and RS232 port. Bootable Flash memory can be supported via an optional on-board SATA Flash module. 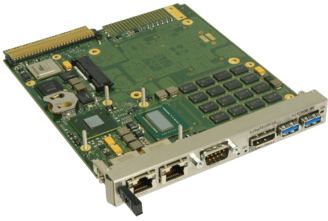 The AM 92x/x1x processor board is ideal for MicroTCA™ and AdvancedTCA® based telecommunications applications such as IPTV, digital media servers, media gateways, broadband – Long Term Evolution (LTE) or LTE-Advanced, wireless base stations, and in test systems for wireline and wireless networks. The AM 90x/x1x is a double-width single board computer. The AM-90x/x1x is designed in compliance to AMC.0, AMC.1 Type 8 (x8 PCI Express®, Gen 1, Gen 2 or Gen 3), AMC.2 Type E2 (2 x Gigabit Ethernet) and AMC.3 Type S2 (2 x SATA ports). The distinguishing feature is the support for the MicroTCA for Physics (MTCA.4) standard which provides rear I/O and precision timing extensions to the MicroTCA architecture, thereby extending the MicroTCA architecture to applications related to physics research.